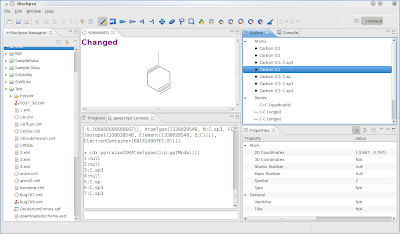 I reported earlier how Bioclipse allows you to use a script to perceive atom types for the content of the JChemPaint RCP editor. This functionality is now available in the outline, and indicates directly if Bioclipse (and the underlying CDK) understands the chemistry you are drawing. In a future Bioclipse release, these problems will be visualized more prominently, likely using the Errors/Problems Views available from Eclipse, or otherwise.